A bad pet food moth infestation broke out at my house in a plastic container of dog bones. The container was full of nothing but coarse dust with moth larvae webbing when I arrived home after a ten month trip away from home. 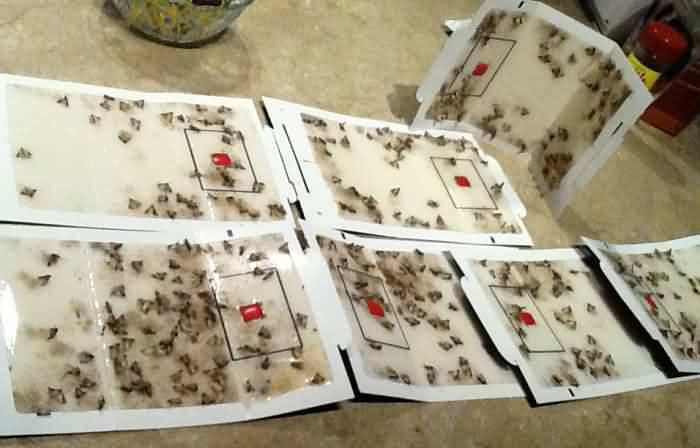 After a couple of weeks with multiple moth traps out, this group of seven moth traps is representative of the great job the moth traps performed. Food moths were under everything including furniture cushions, in baseboard crevices, inside smoke alarms, in every pantry item, and you name it places all over the house, there were too many moths to count. I still have traps out as occasionally, more are occasionally hatching from hidden places I have not yet found. Thank you for being such a great lifesaver, Cleaner Today!